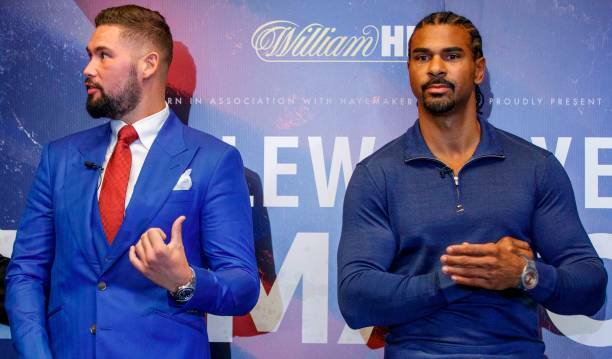 David Haye: If I Beat Bellew, But Scrape Through - I May Retire! Winning is not enough for David Haye (28-3, 26 KOs), for his upcoming fight at the end of the year. Haye will face his domestic rival Tony Bellew in their anticipated rematch on December 17 at The O2 in London, live on Sky Sports Box Office. The two fighters collided back in March, with Bellew pulling off a major upset with an eleventh round stoppage win. Haye severely injured his Achilles during the fight and became a one-legged boxer in the second half of the contest. At 37-years-old, Haye admitted to talkSPORT that his career would certainly be over in defeat. However, he says his career could still be over even in victory - if he defeats Bellew but struggles to win along the way, because that type of outcome would derail his plans for major fights in the heavyweight division. "If I can't beat Tony Bellew, my competitive boxing career is effectively over. There is no need me even mentioning any other names in the heavyweight division, about wanting to fight for titles, fight this guy, that guy. If I can't beat Tony Bellew, then it's over," Haye said. "Even If I win, I may still retire. Even if I beat Tony Bellew, but I scrape through, I get knocked down, I'm struggling, whatever issue I have, I can't then realistically say I want to fight this big guy who is three inches taller, three stone bigger, 10 years younger, undefeated and with a 100 per cent knock-out record. "People will say, 'come on David, get real'. I don't want that, and I'm smart enough to know if and when I can challenge people. I might say, 'OK, even though I've just about scraped through this fight, I know I can't compete with these big guys - that was 10 years ago!' But I really believe deep down in my heart that I've still got it." If possible, Haye would like to win in style - and then move forward with his goal of securing a fight against IBF, WBA, IBO world champion Anthony Joshua, who returns on October 28th in a world title defense against Carlos Takam in Cardiff. "That would be the ultimate perfect scenario," said Haye. "I have a couple of fights, he has a couple of fights. If we both keep winning then a big stadium, me v Anthony Joshua, it doesn't get any bigger than that. However, I can't even remotely even start thinking about that if I can't perform against Tony Bellew." [QUOTE=Deontay Wilder;18147772]David, Knock out Bellend, and if you want one more paycheck after that, come see me. [/QUOTE] Would be a good fight deontay. Do you feel his explosiveness from you're spar has somewhat diminished and you could knock him out?